Fire Leaves Little For Some Colo. Residents The Waldo Canyon fire in Colorado has destroyed more than 300 homes, leaving residents in shock. Firefighters are slowly getting the blaze under control, but many in the community don't yet know what's left of their homes. 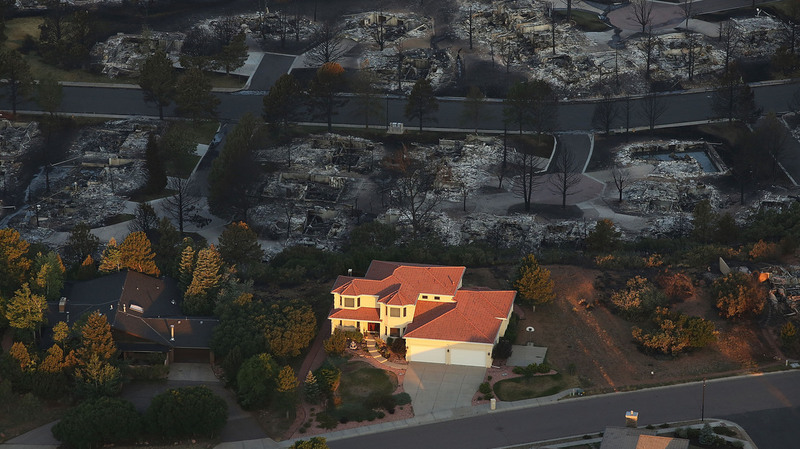 Nearly 350 homes have been destroyed by the Waldo Canyon fire in Colorado. Firefighters are slowly gaining ground on the Waldo Canyon fire in Colorado. It's scorched about 17,000 acres and believed to have claimed two lives. More than 300 homes have burned. There's been a lot of talk about how many houses were lost in the fire, but Colorado Springs Fire Chief Rich Brown wants you to know there's a flip side to that: He says crews worked hard to minimize damage. "Eighty-one percent of the homes in that area were saved," he says. "A lot of areas looked like some of the wooden stairs going up to the house were on fire. The stairs were torn away from the house, preventing those stairs from burning and actually catching the house on fire." Authorities have been slowly lifting evacuation orders for neighborhoods that were not burned. Still, for those who did lose their homes to fire, others are offering support. The evangelical Christian organization The Navigators held a gathering Friday. There were songs, prayers and tears. Though most of the group's buildings are fine, employees were hit hard. At least seven lost their homes to fire, including the couple at the head of the group, Doug and Pam Nuenke. "It was a foreclosure house," Pam says. "We'd done some work on it and just finished our kitchen remodel." "There's some bricks that are standing," Doug adds. "Brick pillars, and the rest is a very well-burned ash pile." The Waldo Canyon fire has affected every part of the Nuenkes' lives. "We're still semi-in-shock and don't really know how we're going to pull all this off," Doug says. "Think of the details that are now involved in our life, with inventory, finding housing," Pam says. "There's a lot of other things to think about. We'll just take a day at a time. Today, I'm taking an hour at a time. I think eventually I'll be taking a day at a time and being able to move forward." More than 1,200 people are working on the Waldo Canyon fire now. Among them is a team that will investigate how the fire started. Lt. Jeff Kramer with the El Paso County Sheriff's Office says there's one problem though: It's not safe for them to begin working in the fire area. "They are in camp, making specific plans on how that team will deploy once they're given that opportunity," he says. "Again, the cause and origin of this fire has yet to be determined, but the right assets are ready to go once they're able to safely do so." Around Colorado Springs, about 10,000 people are still living away from home. Starting Sunday, the city will offer them bus tours of their damaged neighborhoods.